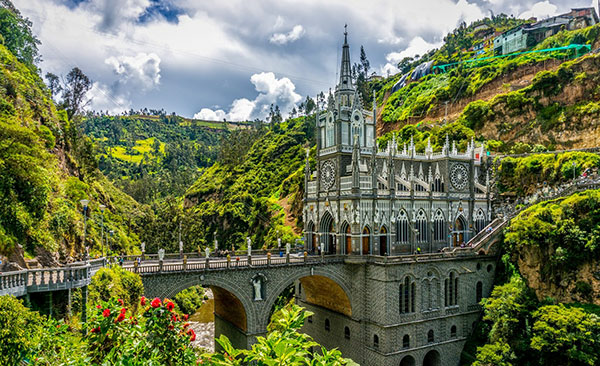 "Las Lajas is a Roman Catholic cathedral and basilica church dedicated to the worship and veneration of Our Lady of Las Lajas Ipiales. This church is located in southern Colombia and continues to be a tourism and pilgrimage desired destination ever since the eighteenth century. The present church was built between January 1, 1916 and August 20, 1949, with donations from regional churchgoers. It goes up 100 metres (330 ft) high from the bottom of the canyon which is connected to the reverse side of the canyon by a 50 metres (160 ft) tall bridge. Exterior of the Las Lajas Sanctuary doesn’t appear very much like an irregular South American Catholic church. However it keeps a lot of their characteristics: it is ornate, richly elaborate and, to many eyes, fabulous. Many places of worship are con"